Once upon a time I had a really fun Spanish Tapas Bar … one of our specialties was Paella. We served either a meat paella, a seafood paella, or the specialty of the house – Paella Parellada combining the best of all! Remember – all recipes are just guidelines! Use whatever vegetables and meat you have on hand. This particular recipe is for a meat paella – but feel free to do this with your own appetite in mind. 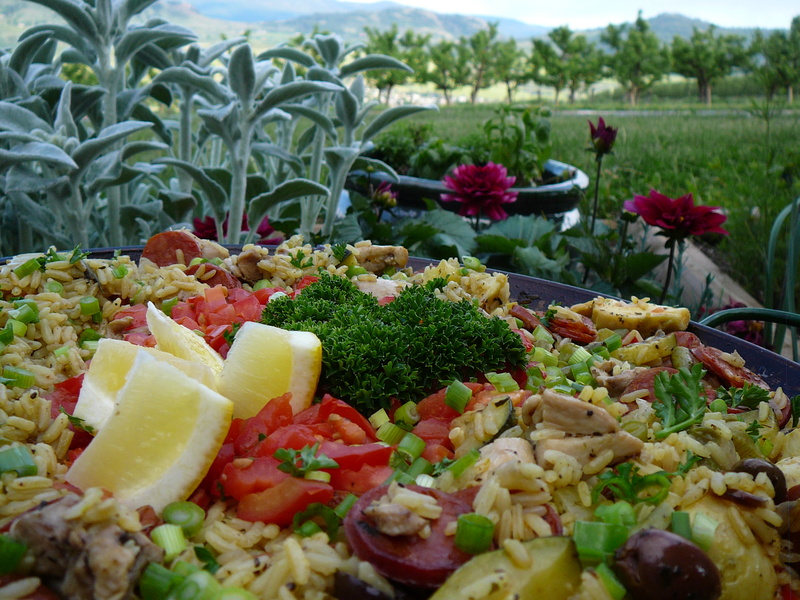 One of our favorites is a seafood paella – and so impressive! Watch for a photo of that one of these days …..
Heat olive oil in paella pan (or other casserole style dish that is not too deep and can be used on both the top of the range and in the oven). When oil has heated, add onions and sweat just until translucent. Add chicken breast and cook until almost cooked through – stirring just enough to allow bits of carmelization on the meat. Add the fresh vegetables and saute lightly. Stir in dry rice, seasonings and stir for a few minutes to allow the rice to heat up a bit, and brown lightly. Heat chicken stock and dissolve saffron threads along with turmeric powder. Slowly pour 3 cups of chicken stock into rice/vegetable/meat mixture and allow to cook just until most of the liquid has been absorbed. Stir in the chorizo sausage, olives and artichoke hearts. Add the rest of the chicken stock if needed. Season to taste with salt and pepper. Go creative – add thinly sliced colored peppers to the top around the dish before covering with tin foil, or your lid, and baking at 350 just until rice has full absorbed and is fluffy. Saute tomatoes only until heated through and pile in the center of your paella – scatter with scallions and parsley. Be sure to serve with fresh lemon wedges to be squeezed over top – this really brings out the flavour! This entry was posted in Beef and Pork, Chicken, One Dish Wonders, Recipes, Spanish and tagged Chicken, chorizo, paella, peppers, rice, saffron, tapas by Chatty Kathy. Bookmark the permalink.